That's why the original LHD acquisition included an option for a 3rd canberra which was not taken up. I think the time has past for the discussion on the RAN will take up an additional carrier. That ship will not sail (at least until Canberra replacement?). They couldn't fund it then, the current economic climate does not suggest there will be funds now. Who's economic climate? Australia's or THE WORLD? Currently Oz is due for reducing the budget deficit (claimed by Libs). If Morrison wants to achieve a budget surplus by 2021, don't expect funds. Not sure if you are serious. Australia has funds and more funds - welcome aboard - our 'conomy goes great guns. In which (Juan Carlos) is a LHD (and not a "dedicated carrier"). IMO, the best solution for smaller navies are multi-role ships. Actually this extends to most other military equipment nowadays. Just like the modern Destroyer or Frigate (essentially the same type of ship nowadays) have replaced the variety of ships of the past ranging from Destroyer Escorts, Destroyers, Light Cruisers, Heavy Cruisers, Battlecruisers and Battleships, the modern LHD is set to replace both Carriers (at least the light ones) and the older types of Landing Ships. This is what IMO makes sense, specially for smaller navies (such as Australia). Last edited by ricnunes on 11 Dec 2018, 17:13, edited 1 time in total. You cannot compare the US Navy with the Australian Navy. Heck, you can't even compare the US Navy with basically any other Navy in the world (at least currently). - The US Navy have lots of funds available - probably the funds that the US Navy has available surpasses the funds available for the entire Australian Air Force, Navy and Army combined? As such the US Navy can have the "luxury" to operate both types of ships. - The US Navy CATOBAR Carriers are the pride of the fleet. If suddenly it was admitted that a ship (LHD) which is cheaper and at the same time can perform more roles than the Carrier was able to perform most of the Carrier's tasks then this would put the Carriers future in jeopardy. So no, I don't believe that you'll ever hear something like "LHD can perform most of the roles of a Carrier" from the US Navy (at least in the foreseeable future). for months on JP-5 with few issues. And LHA-6 is the first LHA where the tradeoff (ownship fuel vs. aviation fuel) can be made. Virtually all fuels can be made from JP-5 at the stroke of a pen. This is why the Prepositioning stocks of fuel are all JP-5 (USMC MPS ships, etc). It can be used pretty much universally. DESC has even considered just buying and shipping kerosene everywhere and then just using the appropriate additives to make specific fuels but the logistics would be really complex. JP-5 can become JP-8 with the stroke of a pen, but once JP-8 can never revert to JP-5. JP-5 can also become DFM with the stroke of a pen, but again can not go back. Shoot, for that matter JP-5 can become JP-4, JetA1, or JetA for that matter. Gas Turbine Ships have never operated on JP-5 because once you pump the JP-5 into the DFM tanks, it becomes DFM. But, as you note, it works just fine and even works fine in anything that can burn DFM (medium and high speed diesels and steam plants). About the only thing it doesn't work for is slow diesels. The biggest difference between DFM (F76, also called Diesel 2 commercially) and JP-5 (F44), from a backwardly compatible standpoint, is cost. The Navy saves a huge amount of money by not having JP-5 as its only fuel. It also helps that when the JP-5 is out of specification, you can just downgrade it. The Navy finds it worth the headache of keeping two fuels. For a variety of reasons that don't really apply to the Navy, the Army and USAF would rather have a single common fuel. Price wise, there's now literally a penny difference between F-76 and JP-5 per gallon. The 2.5% (on average) better energy density from F-76 is probably what's compelling. To say you have tunnel vision on this is understatement. At the time there were statements made of not going forward and of the report to gov..and reported in the news. marauder2048 wrote: Price wise, there's now literally a penny difference between F-76 and JP-5 per gallon. Wow when did JP5 get so cheap?? Last time I had heard it was almost twice as much as JP8. even if the CONOPS are stupid. generation rate e.g. unmarinized attack and heavy lift helicopters. Australian government is just being coy a la Japan. optimist wrote: We can't go anywhere by ourselves and have to work in a joint force, under the US umbrella. The infrastructure needed for a naval air wing, which would probably need more subs, as well as everything above water. Is met with wide eyes when costed out. We got $55 bill/yr deficits from pink-batt insulation and school-halls plus two stimulus handouts, and expanded spending everywhere since then. From $22 bill/yr surpluses, to 27% GDP debt just 11 years later, with more deficits. The left will win next round in 2019 and we'll be right back to that abysmal rubbish again. Almost no one got 'wide eyes' about that though, they all said it didn't really matter. Epic wastage on what was not required. I'd rather deficit or debt was for something that counted and actually did provide some lasting economic stimulus and enduring industrial capacity plus a better security environment for the future. So a logical expectation is that these vessels have a spiral upgrade path in mind and the Australian government is just being coy a la Japan. I think you have got it in a nutshell. Rather than my 'tunnel vision' on this matter I see complete denial about the idea from others - without supporting facts - except 'there are none'. If there are facts existing then why cannot we see them? As I said, any attempt to add fixed wing capability to an amphibious ship not intended by us to operate them, will impact on the existing amphibious capability, which is our primary designated role for these ships. Such modifications aren’t done ‘on the fly.’ You’re talking about permanently adding increased fuel bunkerage, increased air weapons storage and increased logistical support capability into the ship (as both fixed wing and rotary wing will need to be maintained and operated simultaneously). Then you need to add into the equation increased personnel to operate the fixed wing, improved air traffic control / operations and sensor / approach systems, improved deck surfaces and aircraft handling capabilities and so on and suddenly all that available space starts to get eaten up very quickly. Yes they do. They have accepted the level of capability they need includes a fixed wing support capability, but if you think this doesn’t impact the amphibious capability the Juan Carlos can provide, then you trippin buddy. It’s a trade off of defence priorities. For us, amphibious capability and HADR capability is more important than adding a fixed wing fighter support capability into our current mix. Which is why I mentioned that IF additional capability in the form of fixed wing capability were to be added to the current force structure, we’d be looking at an additional ship, at least. I am well aware of that, hence why I have argued for years and Spaz can concur on this, that F-35B onto Australian ships won’t happen in any form. The Abbott led government a few years back looked into it and there was a AUD$13b price tag to be paid IF we were going to do it and even then only achieved by diminishing the current level of amphibious capability we have. 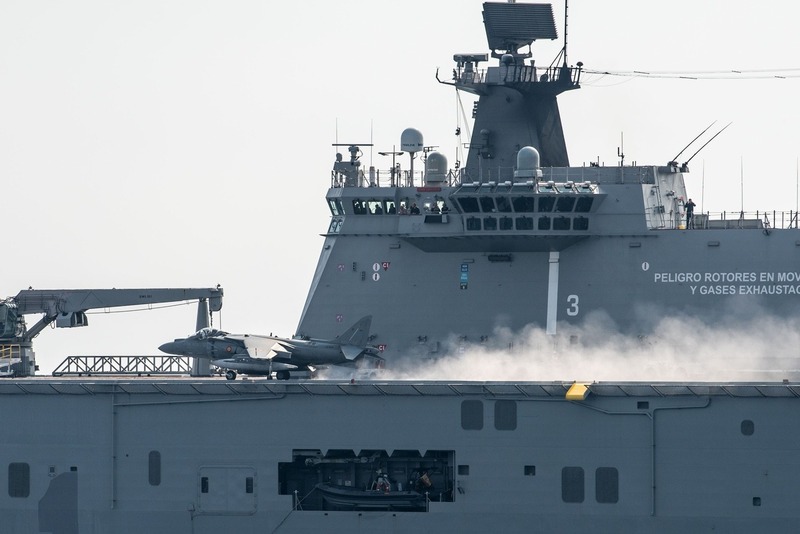 The technical capability to add fixed wing fighter support capability onto the LHD’s isn’t an issue. It would in fact I’d argue, be the least challenging of the issues we’d have to overcome to achieve it. The financial, political, diplomatic and doctrinal issues would be far greater. I know they aren’t flashy to contemplate on a defence orientated forum where wishlists of capability are far more popular than actually acquiring and implementing such things are, but they exist and are in the forefront of the minds of the people who make capability a reality. However my proposed solution of a ‘third ship’ is based on RAN’s long range plans. It currently has a project to acquire a civilian standard helicopter carrying, disaster relief / Pacific engagement ship. This ship will do much of the HADR / Regional visit ‘heavy lifting’ in years to come, while RAN focuses on wartime amphibious capability development. RAN will still provide HADR capability from it’s LHD’s and HMAS Choules but it is expected the new ship will relieve much of that burden. RAN ALSO has a requirement and funding to replace HMAS Choules in years to come and this is where the ‘great white hope’ of a fixed wing fighter support capability should be placed, IMHO. Such a ship would be easily designed with fixed wing operations included from the start and could provide additional HADR and amphibious capability to boot. Not to the levels of the Canberra Class obviously, but additional capability nonetheless. Adding a capability and not diminishing the existing capability will be a far more palatable argument to make to the politicians who will inevitably have to approve such capability. The difficulties won’t go away in terms of political and diplomatic concerns and so forth, but they will be eased domestically when existing capability isn’t impacted and available HADR capability isn’t impacted. To me, this is the only realistic chance we have of seeing a fixed wing fighter support capability added to the ADF force structure within the next generation or so. Personally I don’t think it will happen at all, but if it does this is the most likely course.